An excellent skin moisturiser for those who are constantly under pressure and looking to slow down and get a focus back on themselves. Apply sparingly to your face, hands or body as required with a gentle pressing motion that ensures even absorption into the skin. Organic Aloe barbadensis leaf juice, Organic Simmondsia chinensis (Jojoba) seed oil, cetearyl alcohol*, Organic glycerin, Organic Prunus amygdalus dulcis (Sweet almond) oil, glyceryl stearate citrate*, Coco-caprylate*, Organic Persea gratissima (Avocado) oil, glycerin*, Organic Rosa canina (Rosehip) fruit oil, Lavandula angustifolia (Lavender) oil, Vitrus aurantium (Neroli) flower oil, Pogostemon cablin (Patchouli) oil, Citrus aurantium dulcis (Orange) oil, Tetratheca ericifolia essence, Boronia ledifolia essence, Callistemon linearis essence, Epacris longiflora essence, Crowea saligna essence, Jacaranda mimosaefolia leaf extract, Echinacea purpurea root extract, Chamomilla recutita (Matricaria) flower extract, Calendula officinalis flower extract, Organic Arnica montana flower extract, Organic Cera alba (beeswax), Carrageenan (Chondrus crispus)*, xanthan gum*, glyceryl caprylate*, bentonite (clay), sodium anisate*, sodium levulinate*, potassium sorbate, tocopheryl acetate (vitamin E)*, citral^, d-limonene^, farnesol^, geraniol^, linalool^. 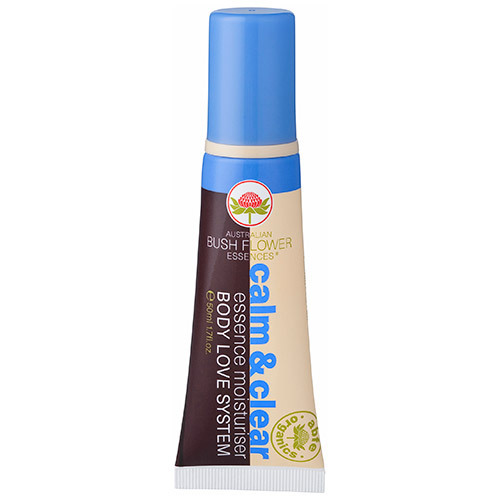 Below are reviews of Australian Bush Flowers Organic Calm & Clear Moisturiser- 50ml by bodykind customers. If you have tried this product we'd love to hear what you think so please leave a review. 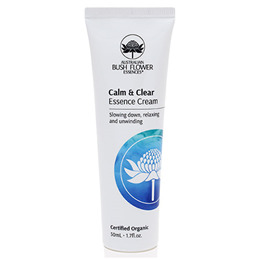 The Calm and Clear moisturiser definitely has a calming influence BUT much greater bonus for me is it is the first moisturiser that I can use on my hyper allergic skin around the eyes. I have tried numerous mosturisers for sensitive skin and none of them work like this one, all causing irritation . I am truly amazed by this product. Another amazing product from Australian Bush Flower. I use this along side the other products from this brand. Completely relaxes the mind and helps me drift off to sleep.